REP Band resistance exercise bands are latex-free. 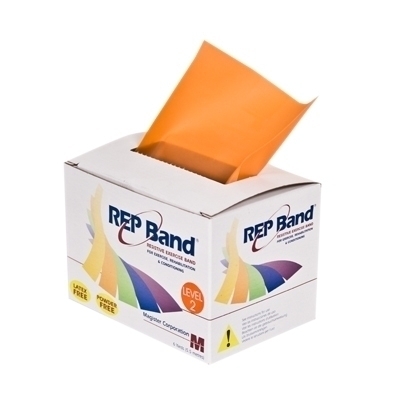 REP Band bands are 4" in width and available in 6 yard and 50 yard dispenser boxes. Available in 5 color-coded resistance levels from peach (easiest), orange, green blue, plum (hardest). REP Band resistance exercise bands are latex-free. REP Band is 4" in width and available in 6 yard and 50 yard dispenser boxes. Available in 5 color-coded resistance levels from peach (easiest), orange, green blue, plum (hardest).